The ancient market town of Stamford, on the River Welland in Lincolnshire, was an important staging post for travellers using the Great North Road from London to the North. However, with the coming of the railway in the 1850s, its position was jeopardized when the Great Northern Railway main line by-passed the town at Essendine, some 4 miles to the north. Local inhabitants feared economic isolation and many blamed the debacle on the Marquis of Exeter, who resided at the nearby Burghley House. He had, with other landed gentry, reputedly objected to the trunk route serving the community whilst allowing the town to be served by the Midland Railway cross-country route from Leicester to Peterborough. To placate the locals, the Marquis financed the building of the Stamford & Essendine Railway, opened in 1856 and worked by the GNR. 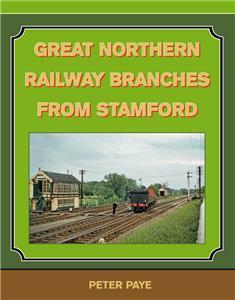 Unable to compete with the MR traffic to Peterborough, in 1867 a second branch was opened south to Wansford on the London & North Western Railway cross-country route from Northampton to Peterborough, initially worked by the GNR, in the hope that passengers would use this route. After a series of disputes, the S&ER became self sufficient – but wiser counsel soon prevailed and the GNR resumed operations, finally agreeing in 1894 to work in perpetuity the S&ER branches as their own. Whilst traffic continued to grow on the Essendine Branch, the same could not be said of the Wansford line, where receipts were abysmal. The L&NER management initially persevered but, despite rationalization, admitted defeat and the line was closed in 1929. The Essendine Branch, having main line connections, continued to offer good services – but travelling patterns changed after nationalization and, as the line only duplicated the ex-MR route to Peterborough, passenger services were reduced before final withdrawal in 1959. Goods traffic followed in 1963, except for services to private sidings, which were retained until 1967.